Noble Vines is a portfolio of wines that are crafted from grapes grown in sustainably farmed vineyards in Monterey and Lodi, CA. 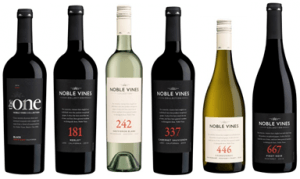 Noble Vines harvests six sophisticated varietals, including 337 Cabernet Sauvignon, 181 Merlot, 446 Chardonnay, 667 Pinot Noir, 242 Sauvignon Blanc and an all-new dark red blend called TheONE Black. The packaging is sleek and modern, so it’s the perfect bottle to gift to your favorite foodie or give to a holiday party host. While the wines are decadent and luxurious tasting, each varietal can be purchased for under $15. Origin Series: Volume Two, The Copper Stills Collection: The latest addition to the exclusive, limited-edition Origin Series, is a distinctive pair of tasting rums that are identical in ingredients, fermentation and maturity, but differentiated by distillation. For the first-time ever, Mount Gay has created one rum that is 100% distilled in a copper pot still and one that is 100% distilled in a copper column still. Its Master Blender, Allen Smith, created the unique pair to give rum drinkers the opportunity to taste the pure essence of each distillation method and learn how each part of the process can chance the flavor profile of rum entirely. The collection is available in 375ml sizes starting in November at premium liquor and spirits stores across the U.S. The SRP is $95. XO Cask Strength: A limited-edition release (only 3,000 bottles will be available worldwide!) of Mount Gay’s award-winning spirit XO to celebrate the 50th Anniversary of Barbadian Independence. XO Cask Strength embodies the essence of Barbados with an aroma that personifies the island’s bold, but humble personality. The rum has an ABV of 63% and will be available in 375ml sizes at premium liquor and spirits stores across the U.S. The SRP is $185. The Special Touch Rum Cocktail Set includes 6 botanicals: Nutmeg, Giant Coffee Beans, Allspice, Cocoa Seeds, Cassia Cinnamon and Orange Strips. A professional citrus zester and serving recommendations also are included. The Spice Lab is the exclusive U.S. importer of Special Touch Botanicals for Cocktails Premium Gift Sets. Designed to create unique cocktails, each gift box includes an array of hard to find botanicals, such as Persian Roses, Cassia Cinnamon and Cubeb Pepper, along with a professional bar tool and drink recipe ideas from noted Spanish mixologist Pepe Orts. The Vino veritas wine basket features wines from all across the Keystone State, selected from both Heritage Wine Cellars and Christian Klay Winery. While you’re visiting Pennsylvania Wine Cellar’s retail location in The Waterfront, be sure to also check out the wonderful selection of specialty wines on the wine wall.